Backup all your Outlook data and settings including Emails, Contacts, Tasks, your Calendar, Notes, Journal entries, Email accounts, Outlook rules, Signatures and many more. And if you need to, restore your Outlook data with only a few clicks! Sooner or later your hard drive will die. Or a system issue will result in lost emails and data. Have you ever asked yourself if your business would survive if you couldn’t recover your important Outlook data? Start automatically backing up your Outlook data with BackupOutlook to avoid such risks. Do you want to save your important Outlook information? 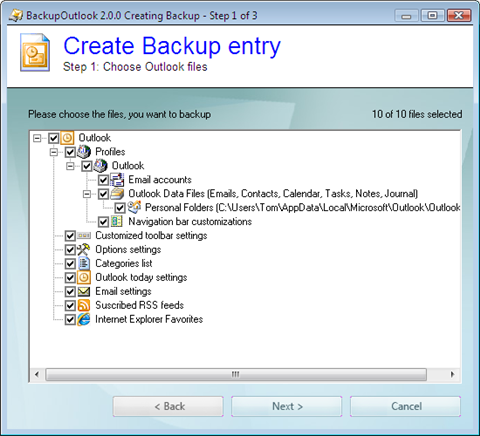 “Backup Outlook” enables everybody to back up all of their Outlook data. You can even protect your Outlook backup with a secure password! Transfer your complete Outlook data and Outlook settings to another computer. Do you have a new PC? Just restore your complete Outlook to the new computer and start working with your Outlook as you left Outlook on your old computer. You need only one license to backup Outlook on the old computer and to transfer your Outlook to the new computer. Is your profile not created yet? No problem! 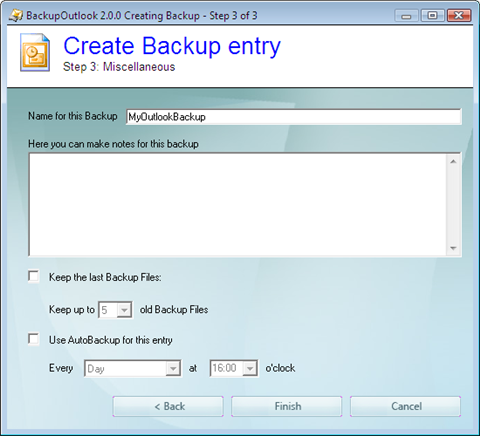 BackupOutlook will create your profile if necessary. Schedule the backup of your Outlook data and keep your latest backups for the case that one backup doesn’t contain the data you are looking for. This way you will never lose any important Outlook information. Your Outlook backup can be compressed if required. Simply choose the compression rate. Exactly which Outlook data and Outlook settings will be backed up by “Backup Outlook”? You can select if only one or all available Outlook profiles are stored. All your email accounts are saved. It doesn’t matter if you have several accounts like one POP3 account, one Exchange account and one Hotmail account. Unfortunately it is not possible to restore your password for your Email accounts. Please keep your Email account password in a safe place. You can review your send/ receive groups in your Outlook menu Tools > Mail Setup > ‘Send/Receive’. Here you have all the information stored for when you want to send or receive your different email accounts. These are the names which are displayed when you start typing an email address. Very useful if you need some addresses frequently. No need to build up this history from nothing again! Which toolbars are displayed and where. Every user creates his own dictionary and this amounts to a great deal of work. Your signature appears at the bottom of nearly every email. Just tick the option for your signature and it will be saved. Many people use personalised stationery with their own corporate design. You can choose to store only one stationery format or your complete set of stationery formats. Do you use a template for message auto-replies? BackupOutlook will save these too. All individual options of the Outlook menu ‘Tools’ > Preferences are stored. Do you use categories? With this setting you save your Outlook categories with one click. The page ‘Outlook Today’ can be customised. You can use summer and winter layout or you can display different folders in this view. Over time, you have probably customised a lot of settings in the Outlook menu ‘Tools’ > ‘Options’ > ‘E-mail Options’. All of these options will be stored. Do you enhance the power of Outlook with your own VBA programs? This setting will save your VBA projects used in Outlook. Your Favorites of your Internet Explorers are backed up. 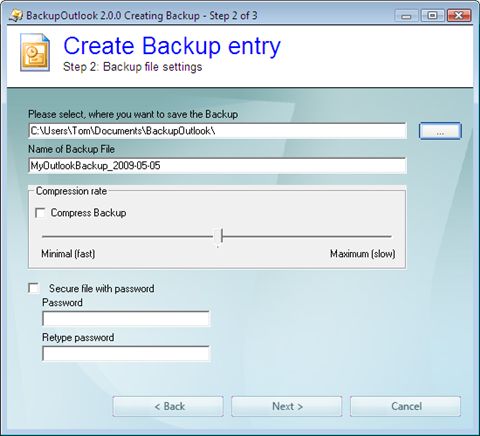 “Backup Outlook” runs on Windows 7, Windows 2000/XP and Windows Vista with Outlook 2000, Outlook 2002 (XP), Outlook 2003, Outlook 2007 and Outlook 2010. When you start 'Backup Outlook' the first time, you see the Start Screen of 'Backup Outlook'. All entries are selected by default. When you are ready with your selection, then click on 'Next'. to go to step 2. Now you can adjust the settings for the backup entry. First choose the location where you wish to save the backup file. Then, if required, you change the compression rate. It's up to you whether speed or file size is the priority Finally you can secure your backup with a password if required. When you are ready then click on 'Next' to go to step 3. In this final step, you choose a name for the backup entry. You can also optionally add notes to describe the backup content. This can make restoring data easier. BackupOutlook also allows you to keep the last x versions of your backup. This is an extremely effective safety net, should you accidentally overwrite your single good backup with a bad one. 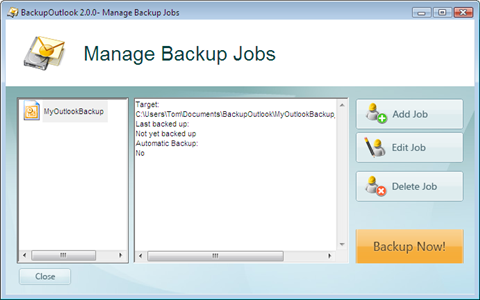 If required you can then set a specific time to automatically run this backup. Finally click on 'Finish' to end the creation of this Backup entry. You see how easy it is to create a backup of your Outlook? With only a few clicks you can sleep better, safe in the knowledge that all of your vital data is backed up. BackupOutlook gives you the chance to try before you buy. You can download and test the software at no cost. 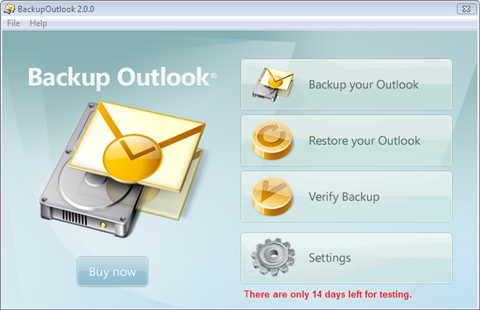 Please note: The test version of Backup Outlook will work only for 14 days. It only allows you to restore data files and a number of settings only. Interested in higher volumes or site licensing? Would you like to discuss special licensing arrangements? Please contact us at sales@unitedaddins.com.